I’ve had the pleasure of ordering a few pieces from Gilded Fetish now and recommend the highly professional and extremely friendly service. My first experience was buying a voucher for my partner and the whole experience was made easy and with the high standard of customer service which is important when buying a gift. The finished product was outstanding and I have to admit to being a little bit envious so ordered one for myself. In both cases Brett gave a very consultative service, asking all the right questions and giving that appropriate amount of push in the right direction so that we both ended up with choices that really expressed what we wanted from our harnesses. I’ve worn off-the-peg harnesses before but nothing beats a made to measure one from Gilded Fetish, I always get admiring comments when I’m out in it! Great service, personal fitting and measuring, timely, fun and the very best finished products. I recommend Gilded Fetish without hesitation, go on, spoil yourself! I’m a proud owner of two creations from Gilded Fetish. The whole process of ordering/designing was thoroughly enjoyable from start to finish, Brett leaves nothing to chance and doesn’t compromise on quality. Every single detail is looked at (even in areas which wouldn’t be on display) to ensure I got the best design and choice. The range in colours/tones and styles is vast and they’ve been extremely comfortable to wear. 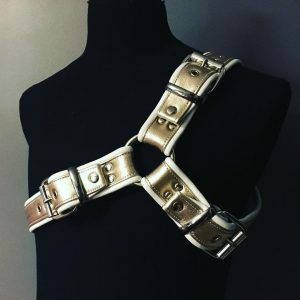 The best part about Gilded Fetish’s designs is that the quality and finish is visibly superior when you place them next to shop-bought harnesses. I already have two more sets of colours and designs that I would like to create through Gilded Fetish so I’ll certainly be coming back for more! 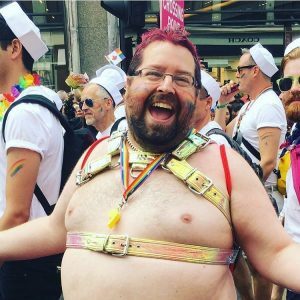 From start to finish, my experience with Brett and Gilded Fetish purchasing my first ever harness was wonderful. From a professional, friendly fitting and advice on materials to delivery, I was really taken care of. My new, gold snakeskin Spartan harness isn’t the only thing that sparkles – Brett’s warmth and generosity are second to none. I am thrilled with the product – it is both beautiful and well made but more importantly, unique because, with Brett’s expert eye as guide, I got to choose the leathers, sizes and look. I can’t recommend Gilded Fetish enough; I will be back soon myself buying something even more fabulously outrageous I hope.